Federal investigators began looking into a suspected grow house in Boca Raton back in 2011. But just a few days after they began their inquiry, the prime suspect allegedly fled the country for Costa Rica. 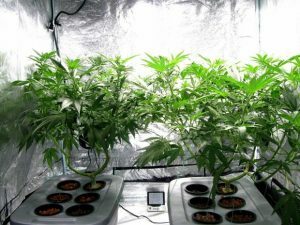 Now, the 69-year-old has been extradited from the Central American country to face charges of illegal marijuana cultivation. However, The Sun-Sentinel reports the man, appearing recently before a Palm Beach County judge, insists he was never an international fugitive because he wasn’t hiding. He pointed to the fact that he continued to pay his taxes to the Internal Revenue Service. What’s more, he was collecting his Social Security payments addressed to Costa Rica and he was even registered with the U.S. Embassy there. He also opened a cigar store and lounge in the capital city and gave interviews to local media. Ultimately, it was a local dispute regarding his cigar store that garnered the attention of local officials, who later discovered he was wanted in the U.S. He later agreed to the extradition to the U.S. on the marijuana grow house charges, which were filed after he left the country. Investigators say there were a total of 984 marijuana plants on the property. An investigation three years ago by USA Today revealed that nationally, there are about 186,000 felony suspects that law enforcement agencies are not pursuing – and for whom prosecutors would not order extradition if they showed up in another state, owing to the lack of time and money needed to retrieve them. Records suggest many more than 1 million fugitives don’t even travel that far to get away. In fact, law enforcement databases from three states indicate about a third of those wanted fugitives don’t have a pickup order if they are arrested in another state – or in some cases even beyond a 25-mile radius. In this case, the fact that Levy did not appear to be hiding will likely work in his favor. Prosecutors are asking for a two-year federal prison term at an upcoming March sentencing. The investigation started in February 2011 when sheriff’s deputies smelled the plant while on bike patrol. Drug detector dogs then also picked up the scene, and a search warrant was obtained. Inside they found nearly 400 mature plants and almost 600 more in various earlier stages of growth. When investigators questioned the landlord, he said he rented the facility to a man who called himself “Jon Smith,” who indicated he needed the space in order to store coffee for his fast-growing business. Ownership of that firm was then traced back to Levy, who the landlord later said was the man he knew as Smith. Authorities also at one point searched Levy’s home and discovered several pieces of hydroponic equipment and other evidence to indicate marijuana may have been grown there as well. Levy later agreed to plead guilty to the charges in exchange for the deal of serving just two years in prison on a charge that our Palm Beach criminal defense attorneys know could have resulted up to 15 years in prison, per F.S. 893.13. The case is a reminder that while Florida voters approved a constitutional amendment that will legalize marijuana for medicinal purposes to people with certain debilitating conditions, it’s still not legal for everyone else.